The $90 Photoshop Elements 6.0 ($70, if you’re upgrading) won’t ship until March. But here’s what to expect when the final version of the software appears. Version 6 introduces a new interface, but, quite honestly, the first thing you’ll likely notice is the program’s zippier launch. In informal testing on my 2GHz MacBook Pro Core Duo, Elements 6.0 opened three times faster than the last Mac version of Elements. That’s because this new version runs natively on both PowerPC- and Intel-based Macs; you’ll need either OS X 10.4 or OS X 10.5 to run Photoshop Elements 6.0. Let’s start with the Edit workspace. (We’ll discuss the other two below.) It lets you choose between Full, Quick, and Guided modes. Experienced users will feel at home in the Full “do anything” mode, though intermediate users may prefer to do their tweaking with a subsampling of common editing controls in Quick mode (the QuickFix mode in previous editions of Elements). In the all-new Guided mode—pictured below—users see a list of task-based questions. Depending on your answers, Elements selects the appropriate tool in the right sequence (thou shalt color correct before sharpening! ), complete with a description of how and why you’re supposed to use that particular tool. 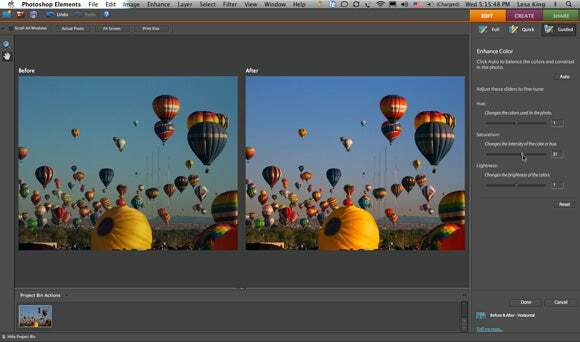 When it comes to editing your images, Elements offers new tools and features throughout the application. The Enhance menu now includes a Convert to Black and White tool, offering six conversion presets, with the ability to tweak each one individually by color channel. The update also adds more powerful sharpening (Smart Sharpen and Unsharp Mask), along with the ability to adjust Color Curves, and Correct Camera Distortion (great for quick edge vignetting!). Perhaps the most useful of all is the new PhotoMerge Group Shot, wherein Elements will create one perfect photo from up to 10 images. It begins with auto-alignment so that the faces can be blended perfectly. Next, choose one photo as the “base” starting point, then use a scribble-like tool to grab the eyes from another photo, and perhaps a smile from yet another, and so on. Elements uses your scribbles as a go-by and automatically figures out how much of the photo to clone in order to blend them seamlessly. Once your photos are edited, enter the Create workspace to present them in a better, easier manner. In Project mode you can work with multiple pages in a single document, allowing you to easily create a photo book (which you can order from within Elements), collage, web gallery, or PDF slideshow. You can begin any project with a Project Bin full of photos (called Photo Bin in previous versions), or create a custom layout and pop the photos in later. Artwork mode houses a plethora of backgrounds, frames, graphics, shapes, text, and themes; you’ll be able to add your own as well.